A few weeks ago, I did a brief interview with Eithne Shortall of The Sunday Times about the Irish musical. In her feature, she writes about Once and The Commitments, and wonders if these two productions suggest that we’ll see more Irish musicals during the years ahead. I think she’s right. I can see evidence of this growth at NUI Galway, where incoming Drama students are passionate about musical theatre, making GUMS (the university musical society) one of the university’s most vibrant student groups. And many students come to study theatre not because they have appeared in work by Synge or O’Casey or Friel, but because they were in a school production of South Pacific or Grease or West Side Story. We’re introducing classes in musical theatre from next year in an attempt both to meet that interest and to stimulate more of this kind of work. Of course, the Irish musical has been around for a while. We saw it work brilliantly almost a decade ago (can it really be that long?) when Rough Magic premiered Bell Helicopter and Arthur Riordan’s Improbable Frequency, a musical about Ireland during the Second World War – which included such hilarious songs as “Be Careful Not to Patronise the Irish”. And we saw it on the main stage of the Abbey only last year with Wayne Jordan’s production of Alice in Funderland by Raymond Scannell and Phillip McMahon. Each of those productions was greeted with a lot of commentary, both formal and informal, suggesting that perhaps – at last – we in Ireland might be on the verge of developing a tradition of musical theatre. An’ at night I would sleep on me Whillie’s white breast! This seems quite an innocent choice, but given that her audience includes Captain Boyle—a former sailor who is supposed to have inherited a large amount of money—her choice of a love song with a maritime setting reveals a great deal about her motives. Arguably, the play’s turning point occurs in that same scene, when we hear Juno and Mary singing ‘Home to Our Mountains’ from Verdi’s Il Travotore. O’Casey does not transcribe the words of this piece; he does not change them to reflect the accent or social status of the singers, but states that they must sing the song well. By showing that the two characters can express themselves perfectly well in this artform, O’Casey hints that they are capable of transcending their circumstances—and indeed makes the case that they must do so. And then the scene concludes with the song “If You’re Irish, Come Into the Parlour” playing on the gramophone while a funeral dirge is underway – a brilliant contrast of kitsch Irishness with the solemnity of the funeral ritual. Juno is not a musical – but its use of music is far more than incidental or contextual: it reveals character, develops the themes, shapes the audience’s responses, and offers us new ways of seeing such issues as nationalism, religion, gender, and the relationship between Irish and international culture. And it seems to me that a lot of Irish plays use music in a similar way: they are not quite musical theatre, but they are much more than “music in theatre”. Tom Murphy has a very similar scene to O’Casey’s in his under-rated 1998 play The Wake, which again sees a family gathering for a sing-song. And there’s a brilliant scene in his The Gigli Concert in which the Irishman acts out the story of Gigli’s youth while Toseli’s Serenade plays in the background. In Garry Hynes’s last production of the play (which I reviewed on irish Theatre Magazine), Denis Conway matched the movements to the music so carefully that it was almost as if he was dancing at times. And the use of song in Conversations on a Homecoming offers rare moments of beauty in a play that is otherwise quite fearlessly ugly. In the blog, I’ve also written a few times about the use of music in contemporary plays. This pattern worries me slightly, since it reminds me of something I occasionally see in the work of inexperienced directors and writers – which is that when you can’t work out how to convey an important mood or emotion to the audience through acting, staging, or writing, you let a piece of music do the work for you (and too often it’s the same music: Sigur Ros, Radiohead, Massive Attack). Yet when done well, music can transform a play. As I’ve recently discussed, Frank McGuinness uses a song from the Mikado beautifully in The Hanging Gardens. Similarly, Conor McPherson’s use of music is almost always successful: I’m thinking of the use of Neil Young as a kind of ironic counterpoint to the action in Shining City or of John Martyn’s Sweet Little Mystery to bring us blinking back into the sunlight in The Seafarer. And then there’s Enda Walsh, whose use of Doris Day in Misterman and more kitsch Irish ballads in Walworth Farce add to the sinister and unsettling quality of both plays. And who can forget the contrast between the intensely verbal sisters in New Electric Ballroom and Mikel Murfi’s amazingly sung “Wondrous Place” in the same play? Enda Walsh, incidentally, is the only Irish dramatist I know of who has won a Grammy – since his song “Abandoned in Bandon” appears on the soundtrack to Once – the Musical. And there are many other examples we could think of. 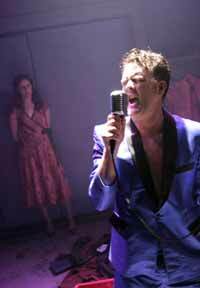 Billy Roche’s The Cavalcaders is arguably as much a musical as The Commitments is (in both cases, song is used as part of the action – songs are only sung when they would be sung in the ‘real world’). Something similar could be said of Christina Reid’s The Belle of the Belfast City. And think of how important music is for Brian Friel – Cole Porter and traditional music in Lughnasa, Chopin in Aristocrats, Thomas Moore in The Home Place, and so on. Likewise, Elaine Murphy’s use of music in Shush seems influenced by Lughnasa – a play which, I think, must also have had an impact on Marie Jones’s restaging of the Blind Fiddler back in 2003. I’m also conscious of how deeply invested in music so many Irish dramatists are. For example, Stewart Parker was, among many other things, a brilliant rock journalist – and it shows in his drama. We can also see the importance of music in some of the recent adaptations that have appeared at the Abbey. As I suggested in that discussion with Eithne Shorthall, Frank McGuinness’s The Dead – which again made use of the songs of Thomas Moore – was almost like a hybrid: not quite a musical but not quite a play either. And it seems that the Abbey’s forthcoming production of The Risen People – opening next week – will be making extensive use of music too. Quite often, establishing an Irish musical tradition is seen as being like beating the All Blacks: something we really should have done a long time ago, but will, we hope, get round to doing sometime in the near future. But could it be that the reason we don’t have a tradition of musical theatre here is because, in some ways, it’s always been so firmly embedded in our theatrical culture anyway? Theatre and Social Media – Or: Why Do So Few Irish Dramatists Use Twitter? Over the last few months I’ve been doing some research on the relationship between social media and theatre. It probably goes without saying that social media has become a kind of theatrical space in which people perform versions of themselves, and there’s a growing realisation amongst theatre scholars that our methodologies and theories can be used to understand how social media works. The essential idea is that Facebook, Twitter and Youtube are all performance spaces, governed by the conventions that apply in theatre. If we accept that the theatricality of social media does something to how we think about identity, then an interesting question arises: what is social media doing to theatre companies and practitioners? I think there are lots of interesting examples of how performances are being extended from the auditorium onto social media spaces – and also would suggest that many plays’ “performances” began several months before the play actually opens in the theatre, in spaces like writers’ Twitter feeds, youtube channels, and so on. 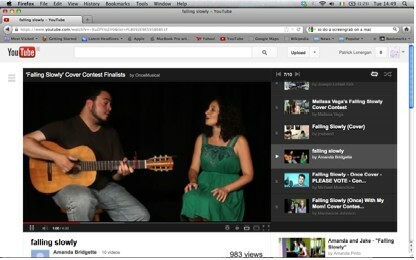 One of the best examples of this extension is the musical Once which, among many other activities, recently encouraged its users to record themselves singing “Falling Slowly” and then to post the results on Youtube. The outcome is a fascinating interplay between immersive or imitative performance and free advertising. I’m also very interested in how theatre companies are using social media in order to perform plays in new ways. A good example of this is the RSC’s Such Tweet Sorrow, which used Twitter to retell Romeo and Juliet. There was also a Google+ staging of Midsummer Night’s Dream, which seemed pretty interesting, albeit that it also seemed to me like another attempt on the part of Google+ to make that platform seem more relevant. It’s interesting to me that very few Irish playwrights have a Twitter account, whereas British writers like David Eldridge, David Greig, Simon Stephens, Bola Agbaje and others have taken to the resource with some enthusiasm. 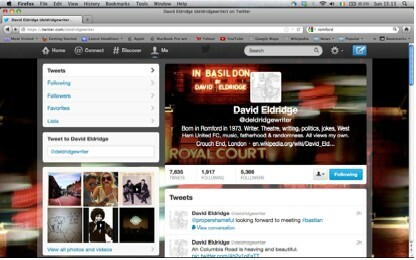 In the screengrabs below, you can see how Greig and Eldridge present themselves to the world: Eldridge’s persona is perhaps more “professional” in that it provides a date of birth and link to his Wikepedia page, whereas Greig lists writing plays only as one of four activities that he engages in. Notably neither writer uses a personal portrait; Eldridge gives his location as “Crouch End, London” whereas Greig simply writers “Scotland”. The number of people following the pair is roughly equal, though Eldridge follows nearly 2000 people while Greig follows a measly 381. So even before we analyse the actual content of these pages, it becomes clear how both writers are performing a persona. And that persona will have an impact on how the work of each writer is received and understood. For example, in his own account recently, David Greig writes about his nervousness for the opening night of Charlie and the Chocolate Factory – and in doing so also happens to mention how much work has gone into it. Eldridge at that time wished him luck – and Greig politely thanked him. In a similar interaction, Simon Stephens consoled Greig on The Scotsman having sensationally and inaccurately claimed that Greig was writing a play about Anders Breivik (the play is The Events, recently opened in Edinburgh and en route to Dublin). 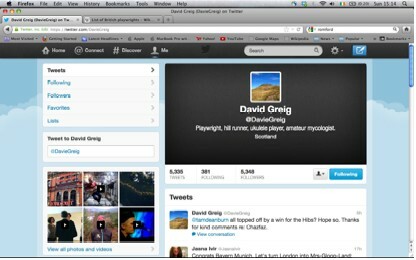 Greig used Twitter to correct the newspaper’s assertions, and to defend himself. So there’s a really interesting performance of these writers’ relationships and attitudes here (and that’s one of the things social media allows us to perform: who we know and who knows us). There’s also a bit of confusion here between the writers as individuals, and the playwright as public figures. And that confusion extends when we start to consider how theatres use social media. Most major theatres now have a social media presence; some have dedicated social media marketing officers; and some use the resources better than others. What is notable about the successful ones is that they tend to create a persona for the theatre, using the word “we” to stand for the institution as a collective, while also using the conventions of one-to-one interactions to create intimacy with users. Mostly those interactions are fairly mundane, dealing with such issues as ticket availability, show running times, and so on. But what’s interesting is that they have the tone of a one-to-one relationship. On one level this is just good customer service, but the performance is also important: theatres are presenting themselves as institutions that are responsive to and understanding of their customers’ needs and interests, which in turn is intended to build the credibility of what they are actually staging. This will have an impact on theatre scholarship. To give just one example, it seems to me that anyone who wants to write the history of the Abbey after 2005 will have to consult with Fiach Mac Conghail’s Twitter account, because it’s such an essential part of that theatre’s story in recent years. Likewise I wonder if a future “collected works” of David Greig or Tim Crouch would have to include their tweets. Many Irish practitioners are active on Twitter of course – I follow and enjoy the tweets or Facebook posts of Mark O’Halloran, Philip McMahon, Fiach Mac Conghail, Willie White, Tom Creed, Una McKevitt, Grace Dyas, Louise Lowe, Declan Gorman, Deirdre Kinahan, and many others. And in general the community here has used social media very effectively as a marketing tool. But I wonder why it is that, whereas many high profile British (and especially Scottish) dramatists are tweeting, we don’t have Twitter accounts from our most prominent playwrights – say, Marina Carr, Enda Walsh, Conor McPherson, Mark O’Rowe, and others? I’m not criticising any of these writers or saying that they ought to tweet – I’m sure they have better things to do with their time, and in any case telling writers what they should write about is just another form of censorship. But perhaps it’s fair to say that within contemporary Irish drama there has in recent decades been a bit of a culture of playwrights tending to keep quiet on matters that don’t directly impinge upon their own work. Friel of course is famously reticent about discussing his work, but he did have a column in the Irish Press early in his career. For many years, Hugh Leonard had a column in The Sunday Independent but the curmudgeonly persona that he tended to adopt made it difficult (for me anyway) to determine when he was being fully serious. But otherwise we don’t often find Irish dramatists writing or speaking publicly about matters of broad social concern. And, to be clear, I’m not saying this never happens – just that it doesn’t happen as often here in Ireland as it does elsewhere. I’d contrast the Irish situation with the one in, say, Scotland, where dramatists like Greig often participate in public debates about (for example) Scottish independence. Similarly in England we’ve seen how David Hare has responded to many recent events not just by writing plays like The Permanent Way or Stuff Happens, but also by publicly debating the issues that inspired those works. I’d also contrast the situation in Irish drama with that in Irish fiction, noting the many excellent articles on the post-2008 crisis that have been written by people like Colm Toibin and Anne Enright, mostly for The London Review of Books. In other words, the key distinction is, I think, that writers like Greig and Toibin and Enright tend to be asked what they think about broader issues. It’s not that our playwrights have nothing to say, then – but that, perhaps, we aren’t asking them the right questions. I know that much of the focus in the Irish arts community in recent years has been on things like the National Campaign for the Arts (and one of the best contributors to that debate was Sebastian Barry). I’m also conscious of the fact that many Irish theatremakers are choosing to do their campaigning on the stage: Frank McGuinness, to give just one example, has had an enormous role to play in the liberalisation of Irish attitudes to homosexuality, and in the creation of better understanding between north and south. But it’s often the case that we only realise someone has something to say when we ask them a question. Watching the post-show talks for Colin Murphy’s Guaranteed (which in including Murphy himself and Gavin Kostick featured two playwrights) I was struck by the thought that this play about economics might just as easily have been discussed by five playwrights (rather than two playwrights and three economists). But perhaps we might think more about asking dramatists and other practitioners what their views are on those subjects. The results could be interesting.